This February, the Macy’s Museum Month invites you explore local museums with 50% off regular admission and to discover something new at these exciting exhibitions. Leap into 40+ museums in San Diego this February. Presented by Macy’s, this popular event allows participants to enjoy half-off entry fees at 40+ San Diego Museum Council membership museums. The savings encourages locals and visitors to explore a variety of arts, culture and science-oriented destinations. From Oceanside Museum of Art down to the Tijuana Estuary, there are ample opportunities for edutainment, creating memories and fun for the whole family. One of guitar maker Christian Frederick Martin’s greatest contributions to our musical landscape was its 1916 introduction of the Dreadnought style guitar. Named after the game changing British war ship, the HMS Dreadnought, this large-bodied, powerful acoustic guitar still thrives today. It is a primary tool of countless musicians, and a mainstay in the factories and shops of guitar builders around the globe. 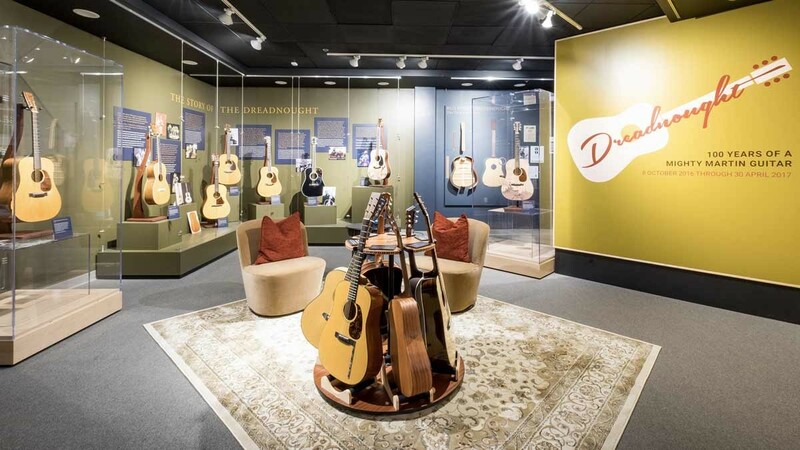 Come visit this unique special exhibition and experience the Dreadnought for yourself. Explore the seemingly impossible, yet technologically crucial Chinese typewriter – a machines that inputs a language with no alphabet, yet has more than 70,000 characters. Experience the puzzles themselves along with other rare Chinese and Pan-Asian IT artifacts and materials from printing, telegraphy, typewriting and computing in China, Japan and Korea – the first exhibition of its kind. Be the Astronaut is a fun, interactive adventure where you are in control as you launch a rocket, pilot a spaceship, and drive a rover in space! 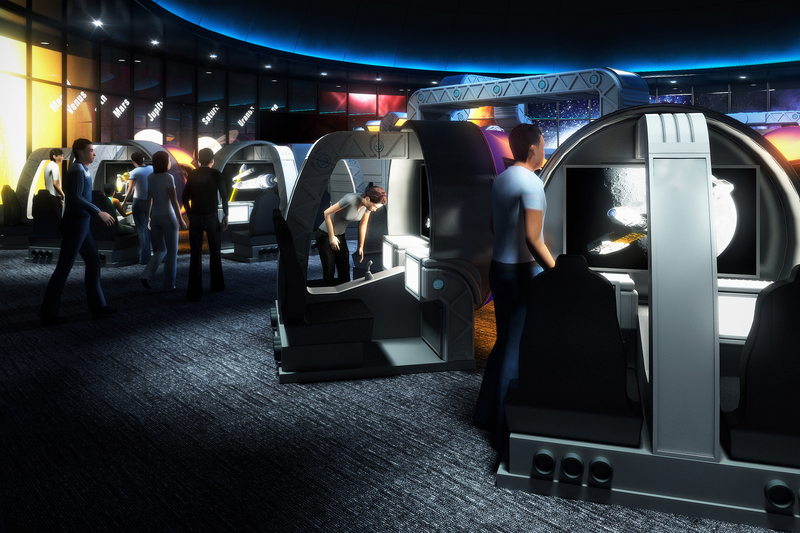 Discover the solar system first hand with the help of virtual astronauts, and land on multiple worlds, including the moon, Mars, Jupiter and asteroids. Designed with the help of NASA experts, Be the Astronaut is fun for the whole family and takes STEM learning into outer space! A terrible crime! A clever mystery! The game is afoot! A terrible crime has been committed. 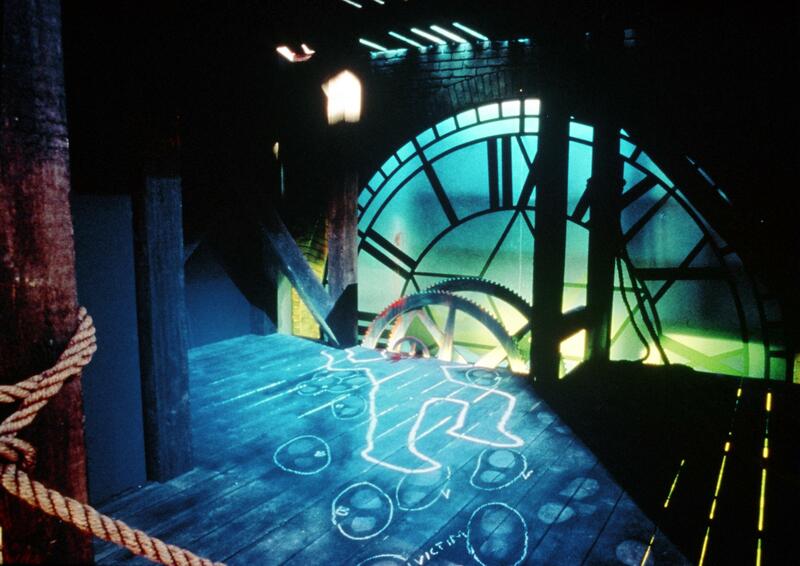 Victorian London’s most celebrated detective needs your help to find out “whodunit!” Sherlock Holmes and the Clocktower Mystery is a clever, interactive exhibition at the Fleet Science Center that will challenge your powers of observation and deductive reasoning as you work to solve a baffling mystery. Cutting-edge, 21st century technology puts a new twist on these prehistoric creatures, bringing them to life-like never before. Through the use of augmented reality technology, full-scale dinosaurs are transformed into flesh-covered animated beasts. This same technology highlights the continental drift that altered the landscape of the ancient world, setting the stage for the evolution of these bizarre creatures. Feel the exciting and intimidating presence of these exotic creatures as you wander among 16 life-size casts and numerous prehistoric specimens. From the tiny Eoraptor to the massive Giganotosaurus (T. rex‘s bigger, badder cousin), Ultimate Dinosaurs is a fascinating study of species you haven’t met before. 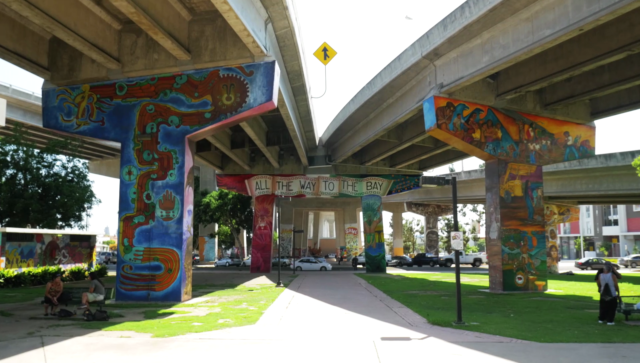 In January 2017, the National Park Service named Barrio Logan’s Chicano Park a National Historic Landmark to recognize it’s cultural and historic significance to San Diego and it’s community. As the National Park Service enters its second century of service and strives to tell a more inclusive and diverse story of America’s history, U.S. Secretary of the Interior Sally Jewell today announced the designation of 24 new National Historic Landmarks. The National Historic Landmarks Program recognizes historic properties of exceptional value to the nation and promotes the preservation efforts of federal, state, and local agencies and Native American tribes, as well as those of private organizations and individuals. The program is one of more than a dozen administered by the National Park Service that provide states and local communities technical assistance, recognition and funding to help preserve our nation’s shared history and create close-to-home recreation opportunities. On April 20, 1970, community residents occupied Chicano Park in San Diego, California, in an ultimately successful effort to prevent the construction of a California Highway Patrol substation on land where the City of San Diego had promised the neighborhood a community park. Representative of the Chicano Civil Rights Movement, Chicano Park has become a cultural and recreational gathering place for the Chicano community and is the location of the Chicano Park Monumental Murals, an exceptional assemblage of master mural artwork painted on the freeway bridge supports. One of San Diego’s most vibrant and exciting historic neighborhoods, Barrio Logan is home to young artists and designers as well as families who have resided in this industrial, seaport area for generations. Long a hub for Chicano art, culture and activism, Barrio Logan is now a destination spot for its gallery scene and authentic dining. When you arrive in San Diego, you can see the world as soon as you step off the plane. Eighteen worlds, in fact from the 100 Worlds Project. They’re the work of Ron Miriello, himself a man of many worlds. The graphic designer, creative director, business owner and sculptor created his “100 Worlds Project” as a way of rediscovering everyday items. 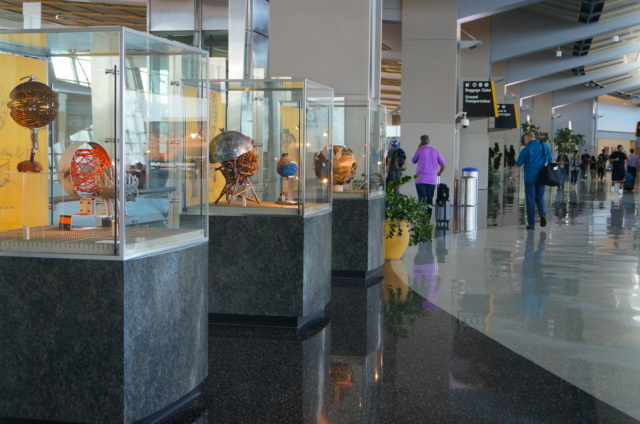 The collection is on display until December 2016 near Gate 33 in Terminal Two West post-security. It’s part of the airport’s latest art exhibition, “Port of Entry“. The exhibition features a group of artists inspired by the geographic, cultural and social aspects of borders. One of Miriello’s globes is made of the soles of shoes worn down from walking. Another is a cluster of little pencil nubs, packed tightly in a metal casing. Some are playful, others serious. Many have industrial components: rugged metal cables, welded steel, pipe wrenches and inner tubes. Miriello collaborated with craftspeople from across San Diego, but particularly Barrio Logan where he works. He wanted to draw on the neighborhood’s rich tradition of manufacturing and engage people who might not consider themselves to be artists. 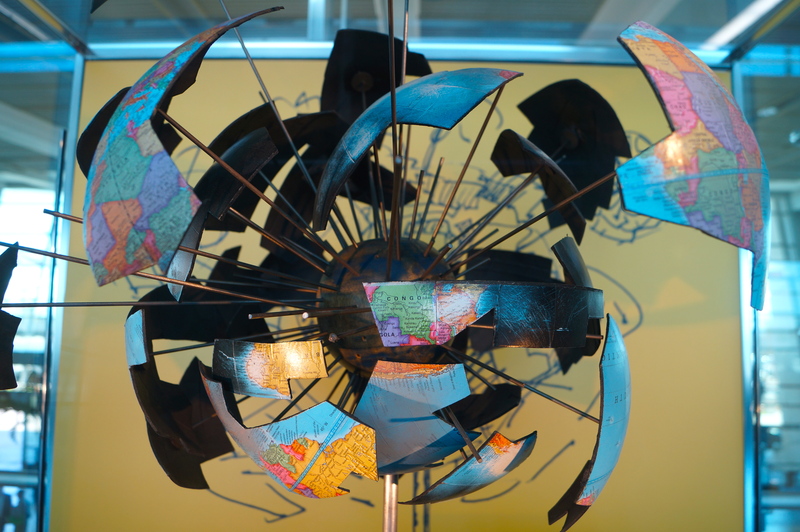 A large, brightly colored globe is carved out of old board games, dotted with dice and marbles. Miriello says the concept came to him when he was sitting in a favorite coffee shop in North Park, sketching. He sees connections between artistic experimentation and the region’s strengths in research and innovation. Although he call’s his project “100 Worlds,” he has only created 50. He likes the idea that it’s open-ended, and the rest might come from someone who saw his work and was prompted to build their own globe. He hopes that his art will help shape visitors’ impressions about San Diego, lingering as a memory from when they first arrived, perhaps even producing a new way of thinking about travel, communities and interconnectedness. If you’re the type that wants to rock out on the weekends, but have children, it’s hard to reconcile those two things. Not every concert is friendly to all ages, nor is there an overwhelming number of places where you can take the whole family and have an outing that everyone will enjoy. But it doesn’t take too much digging to find some concerts that you can bring the kids to. Here’s a roundup of some of the better options for family-friendly concerts in San Diego. Family friendly rock concerts aren’t always so easy to come by, but when the kids are the ones putting on the show, it certainly adds an interesting option to the table. School of Rock offers music education to kids with an emphasis on the “rock,” and several times a year they put on concerts showcasing either the work of a particular artist, ranging from icons like Led Zeppelin to more esoteric acts like Neutral Milk Hotel, or thematic shows, such as the popular annual local music covers show. 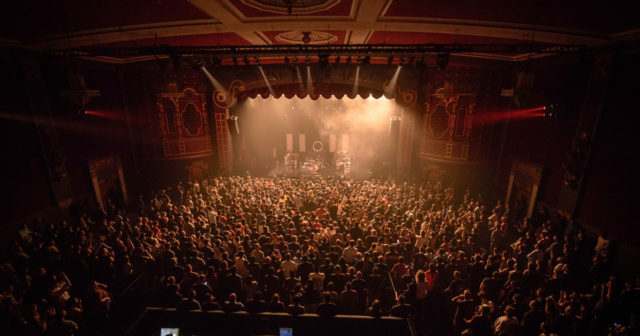 The venues change each time, having been held as locales such as House of Blues and The Irenic, but there’s really no bad place to see junior find the rock star within. There’s nothing quite like a trip to the fair. 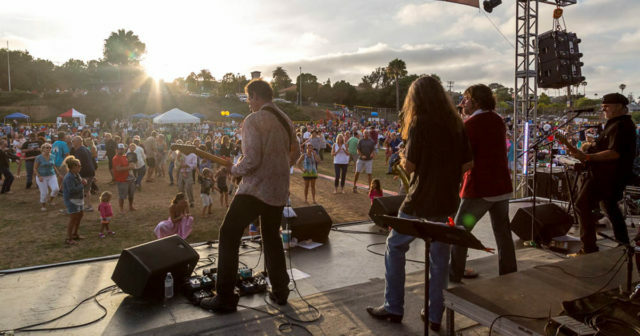 Every summer, the San Diego County Fair offers families a chance to indulge in all kinds of fried concoctions, carnival rides and, of course, live concerts. As it turns out, most of those shows are open to all ages, and this year’s 2016 lineup includes some big names, including Brian Wilson, Joan Jett, Carly Rae Jepsen and X Ambassadors. So make a day of it: Gobble some fried cheese, pet some friendly sheep and take in a concert before heading back home. 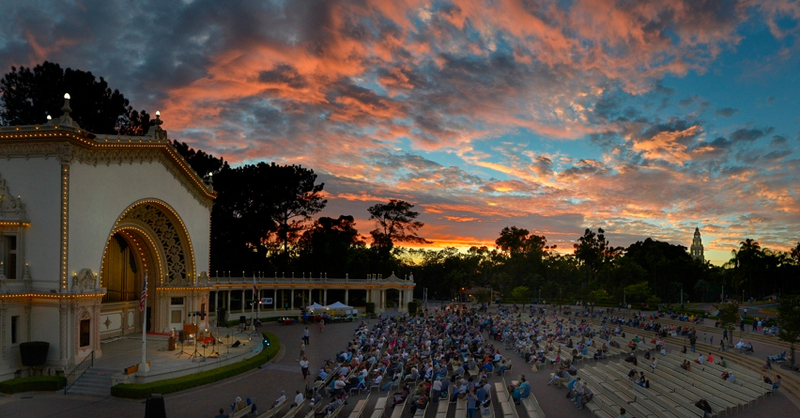 The Spreckels Organ Pavilion in Balboa Park has been regularly hosting Sunday afternoon performances for years, which are always free and open to all ages. However, of late those shows have expanded from being mostly classical to incorporating more contemporary rock, pop and experimental music. Civic organist Carol Williams recently led a pair of tributes to the music of David Bowie, and in 2014, she collaborated with local punk band Drive Like Jehu on their first live show in 20 years. Taking the family to the park is never a bad thing to do on summer weekends. Everyone gets out of the house, gets some fresh air and takes part in something that doesn’t involve looking at a screen. But add music to the equation and it’s even better. 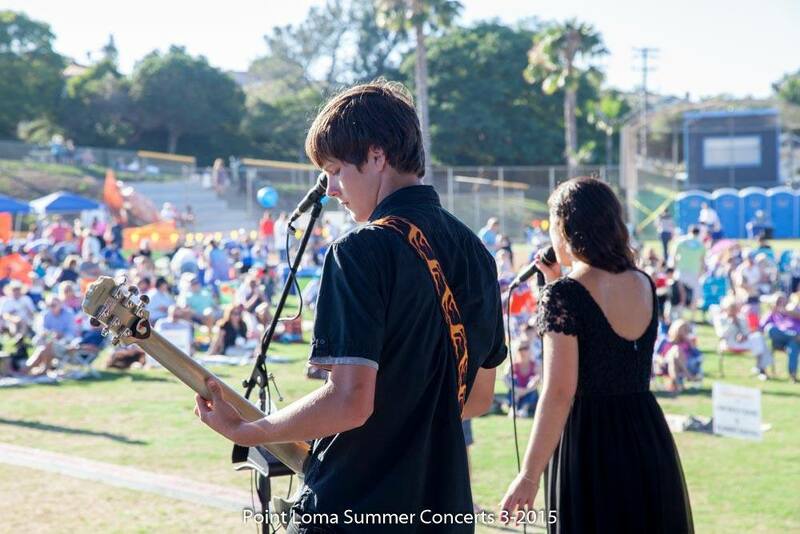 The Point Loma summer concert series in Point Loma Park features a variety of concerts featuring local bands outdoors in a comfortable and fun setting that’s accessible to everyone. Even better, there’s a raffle each year, with proceeds going toward music education and music nonprofits. Featured photo courtesy of Cynthia Sinclair. There’s a lot of competition for live music in San Diego, and the competition doesn’t always come from other live shows. Beaches, parks, museums, galleries – there’s no shortage of options for fun summer activities, but if you’re starting to figure out your summer plans, I’d like to suggest marking a few select dates on your calendar for some great concerts coming to town between June and September. I’ve assembled some great options for those seeking out a great live music experience this summer, from old-schoolers to newcomers, be it rock, pop or R&B. Start planning now – you don’t want to miss ’em. The Beach Boys’ Pet Sounds celebrates a milestone 50-year anniversary this year, and founding member and singer/songwriter Brian Wilson is playing the album in its entirety on tour. One of the stops is at the Del Mar Fairgrounds, and the concert is free to ticketholders at the San Diego County Fair, which is a major plus. God only knows there aren’t many opportunities to hear one of the great artists of our time perform the entirety of one of the best albums ever released, especially without paying a steep ticket price, so wouldn’t it be nice to be there when it happens? Three of the best shows I’ve seen in the last year and a half were all played by Savages. The London-based outfit has a dynamic stage presence, intense but big-hearted, loud yet overflowing with charm. It doesn’t hurt that their two albums, Silence Yourself and Adore Life are two of the best indie rock/post-punk records of the past five years, and in a live settings they grow into something even more powerful. This one’s at the top of my list, and should definitely be up there on yours as well. Individually, I’d be pretty enthusiastic about recommending a show that featured either Duran Duran or Chic, but both bands? That’s definitely a must see. New wave icons Duran Duran have been on tour with disco/funk legends Chic since earlier this spring, but their double-headlining old-school dance party makes their way to Sleep Train’s outdoor stage right in the middle of summer, making for a perfect night of vintage jams in an open-air setting. Freak out! California’s Anderson .Paak (the period is intentional) has been making funky, just slightly psychedelic R&B for a few years now, but his new album Malibu has made him an early MVP for 2016. His style is a mix of ’70s-era soul a la Stevie Wonder or Marvin Gaye, filtered through contemporary electronic and hip-hop sounds, with more than his fair share of unique quirks. His music is pure joy, and nothing but good times are guaranteed when he hits the stage. If you need an excuse to stay a little longer in San Diego, we have one word for you: festivals. From Shakespearean folios to interactive film fests, you can immerse yourself for a day or a week, enjoying the unique combination of cultural enrichment and pure escapism at these fun fests. Title page with Droeshout engraving of Shakespeare. Credit: Shakespeare First Folio, 1623. Folger Shakespeare Library. Fans of the Bard are in for a treat, as San Diego is the only California stop for “First Folio! The Book That Gave Us Shakespeare,” a traveling exhibition commemorating the 400th anniversary of the playwright’s death. 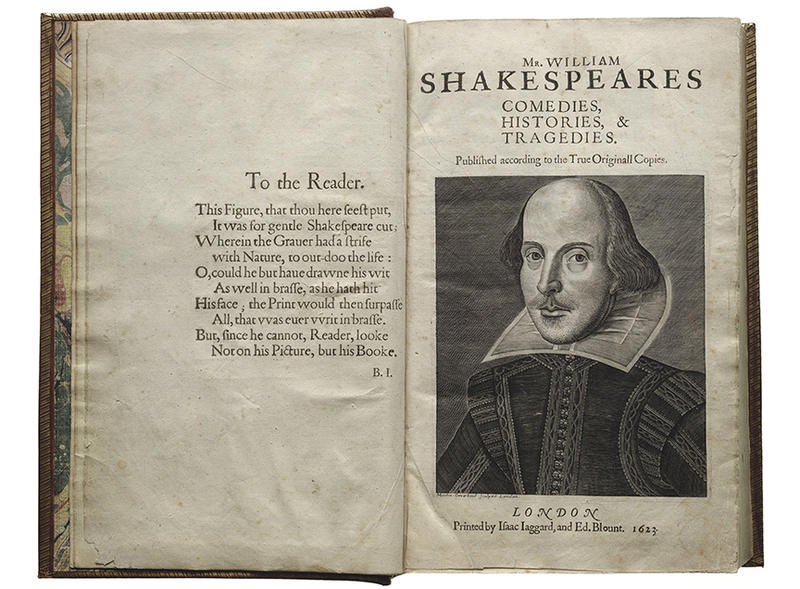 The folio is the first collected edition of Shakespeare’s plays, published in 1623 by two of his fellow actors. Without their foresight, treasures such as “Macbeth,” “Julius Caesar” and “Twelfth Night” might have been lost. The rare volume will be on display from June 4 to July 7 at the San Diego Central Library’s Art Gallery, complemented by props and costumes from The Old Globe Theatre. Admission is free but reserving tickets in advance is highly recommended. In addition, the Old Globe, San Diego Public Library and several partners are hosting Shakespearean-themed performances, panel discussions, film screenings, family workshops and tours – even an alternate reality game – throughout May, June and July. Many of the events are free; some require reservations. At the Jacobs Center’s Market Creek Plaza Amphitheater, you’ll find a year-round calendar of culture from jazz to culinary fusion. 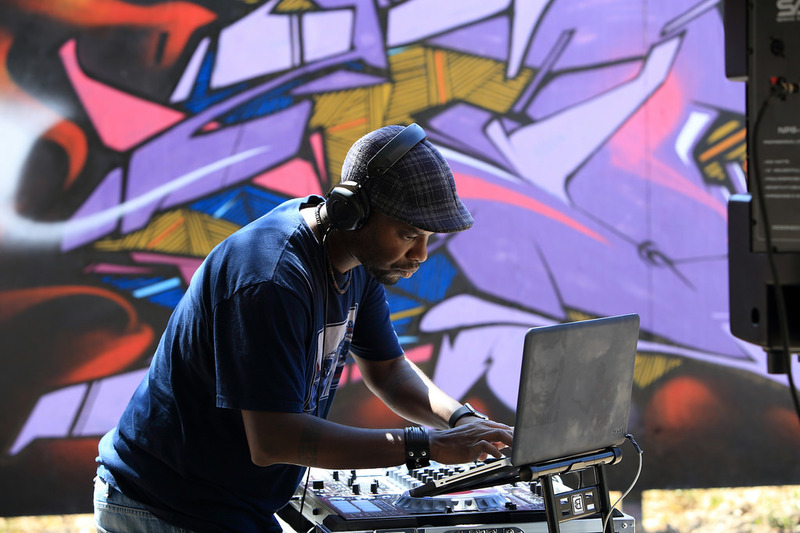 On June 25 from noon to 5:00 PM, the Poets and Painters Spoken Word and Graffiti Art Festival presents award-winning poet/playwright Gill Sotu along with Writerz Blok graffiti artists Jose Venegas and Sergio Gonzalez. This free event includes a poetry slam, live mural painting, music, storytelling, hands-on workshops and some of the hottest all-style dance from The Junkyard Dance Crew. 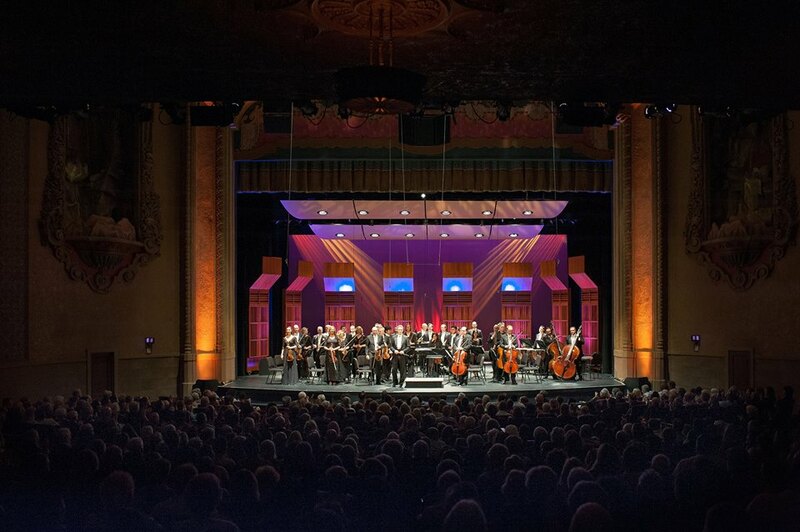 The Mainly Mozart Festival is a long-running local tradition, expanding over the years to include a range of composers from the 18th and 19th centuries. Performances are held in cathedrals, the outdoor Spreckels Organ Pavilion and the exquisitely restored Balboa Theatre, a 1924 jewel box that CNN Travel listed in the top ten of “World’s Most Spectacular Theatres.” This year’s edition of Mainly Mozart is more than music – there’s also a one-woman play, “The Other Mozart,” and a three-day symposium, “Mozart & the Mind: an Exploration of Prodigy,” with renowned speakers from science, medicine and the arts. Downtown may be the best known area of San Diego, but there are plenty of places to explore beyond downtown’s borders! 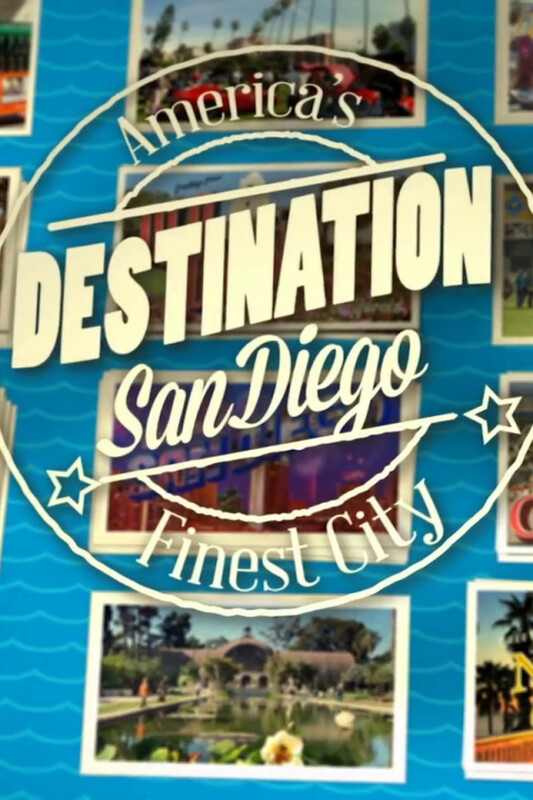 In this edition of Destination San Diego, we’ll explore some of the neighborhoods in Southeastern San Diego. We’ll also take a look at the story of the spectacular span between San Diego and Coronado, then venture to a historic street in Chula Vista. And, we’ll show you a spot just northeast of downtown San Diego that’s been called “the best backyard in San Diego.” Plus, local surf and action photographer, Aaron Chang, dishes on San Diego’s art scene, inspiring views and the can’t-miss galleries. In this episode of Destination San Diego, we’ll introduce you to City Heights – an urban neighborhood that is a true melting pot of different ethnic groups. Home to authentic ethnic restaurants and markets, hidden artworks and live music venues, City Heights is an undiscovered destination in San Diego. We’ll also check in at the beautifully restored Cosmopolitan Hotel in Old Town, and explore another historic building restoration that “electrified” the downtown skyline. World-renowned conductor of the San Diego Symphony, Jahja Ling, shares his most inspirational sites and favorite art and cultural experiences around town. And, we have your tickets to watch the many evolutions of Balboa Park’s Old Globe Theatre. 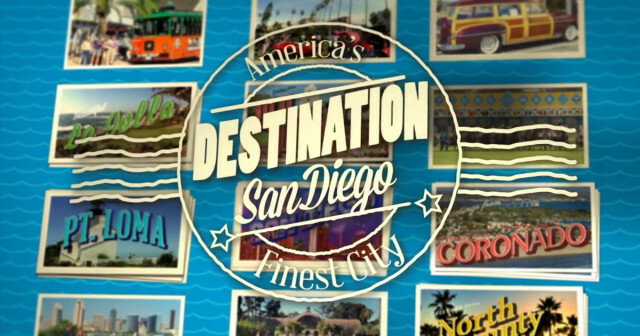 On this edition of Destination San Diego, we’ll show you one of San Diego’s best kept secrets – the vibrant Barrio Logan neighborhood. An epicenter of the city’s Mexican-American culture, this neighborhood is quickly becoming a hotspot for cutting-edge art and authentic local culture. The neighborhood is also home to Chicano Park, the largest collection of Chicano murals in the world. We’ll also tour the history of the iconic El Cortez and takes a look back at when Old Town was still considered new. Plus, celebrity chef Marcela Valladolid dishes on San Diego’s flavorful foodie scene and where to find the most delicious Mexican dishes. Tune in to this edition of Destination San Diego to learn more about two of Balboa Park’s neighbors – North Park and South Park. These revitalized urban neighborhoods are fueled by art galleries, diverse restaurants and nightlife, and North Park proudly holds claim to being “the best beer neighborhood in the nation.” In North Park’s north end, we’ll travel down El Cajon Boulevard for a quick history lesson. Over in Balboa Park, we’ll take a look at the many faces of the Ford Building and show you a miniature wonderland inside the San Diego Model Railroad Museum. Plus, the San Diego Zoo’s animal trainer, Rick Schwartz, takes you behind-the-scenes at some of San Diego’s best spots for kids of all ages.